Author(s): Sylwia Flis, Department of Pharmacology, National Medicines Institute, Chelmska Street 30/34, 00-725 Warsaw, Poland. Malgorzata Statkiewicz. Colorectal cancer (CRC) evolves as a result of the progressive accumulation of genetic and epigenetic alterations. Such changes lead to the conversion of normal colonic epithelium to colon adenocarcinoma. In most cases, CRC develops as the pedicle adenoma, much less as the sessile adenoma, wherein initially non-invasive cancer is formed (only present in the mucosa = carcinoma in situ) and then it progresses to more invasive disease (after infiltration beyond the lamina propria). Although changes in the DNA methylation pattern are seen as a cause of cancer, their appearance in early stages of cancer can be useful at the step of diagnosis. This can result in a quicker and less invasive diagnosis of the disease as well as in a better planning of therapeutic strategies for patients. The aim of this brief review is to highlight the most important findings on the role of DNA methylation as one of epigenetic alterations associated with CRC. Keywords: Colorectal cancer, CpG island methylator phenotype, DNA methylation, DNMT inhibitors, epigenetic biomarkers. Affiliation:Department of Pharmacology, National Medicines Institute, Chelmska Street 30/34, 00-725 Warsaw, Poland. Keywords:Colorectal cancer, CpG island methylator phenotype, DNA methylation, DNMT inhibitors, epigenetic biomarkers. Abstract:Colorectal cancer (CRC) evolves as a result of the progressive accumulation of genetic and epigenetic alterations. Such changes lead to the conversion of normal colonic epithelium to colon adenocarcinoma. In most cases, CRC develops as the pedicle adenoma, much less as the sessile adenoma, wherein initially non-invasive cancer is formed (only present in the mucosa = carcinoma in situ) and then it progresses to more invasive disease (after infiltration beyond the lamina propria). Although changes in the DNA methylation pattern are seen as a cause of cancer, their appearance in early stages of cancer can be useful at the step of diagnosis. This can result in a quicker and less invasive diagnosis of the disease as well as in a better planning of therapeutic strategies for patients. 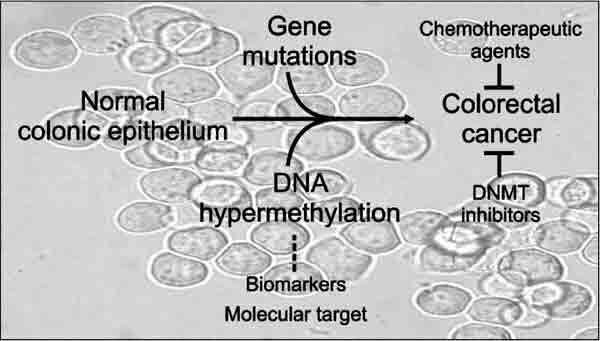 The aim of this brief review is to highlight the most important findings on the role of DNA methylation as one of epigenetic alterations associated with CRC. Can Colorectal Cancer be Prevented or Treated by Oral Hormone Replacement Therapy?